When journalists and political activists prominently feature in a literary festival, you know that freedom of speech is a major issue. "We're like the villain of a horror film," said Pakistani writer Mohsin Hamid about the international view of Pakistan. This statement set the stage for an alternative narrative in Pakistan during the recent Karachi literary festival. The event was attended by some of the best-known writers, activists and artists in the country. But what was clear throughout all the crowded, passionate sessions was that these voices are at risk of being drowned out by extremism. On a hot and tropical day, the halls of a coastal Karachi hotel were filled with young and old, some wading slowly through the crowds on crutches. The most popular sessions were those that discussed the identity of the country and the ever-present question of Pakistan's future. Madiha Gauhar of the Ajoka theatre organisation talked about her play Burqavanza, which was banned by the government in 2007. She said the play was about "love in the time of jihad". Love can be a dangerous thing. According to the director of Pakistan's Human Rights Commission, there were 556 "honour killings" in 2010 - and the number is rising. Ms Gauhar said "love is prevented by so many forces… and it happens every day over here, no matter what class you belong to". She had to face a parliamentary committee inquiry into her play. "It's a dangerous game sometimes, you get threats and it's life threatening but it's so needed here." In another session, Mohsin Hamid took the opportunity to highlight a recent incident in which an actress was condemned by an Islamic cleric for ruining the reputation of "Islam and Pakistan" when appearing on an Indian reality television show. She later appeared with the cleric on a talk show and defended herself and her role as an entertainer. "She's my hero... It's so rare to see someone speak against a mufti. There's a degree of self-censorship, and people who have guns are making Pakistan," Mr Hamid said. It was inevitable that the Taliban would be a subject for discussion at such an event. Taliban expert Ahmed Rashid spoke fervently about their role in Pakistan. "Taliban is a home-grown phenomenon. Drone attacks in Pakistan are happening with our government's permission... so why can't we be self-critical?" he said. The true story of Pakistan occupied much of the conversation on the sidelines too. Maleeha Lodhi, previously a journalist and then a diplomat, stressed the importance of situating the literature of an era within the political and social context. "Journalists are the best storytellers," she said. Yet some writers say they are able to eschew the strife and militancy that dominates life and narrative in Pakistan. Bina Shah says she believes extremism can be kept out of the equation. "I can ignore it," she said. "I can write a story that has nothing to do with it, and I have." But for writer Mohammed Hanif, who was previously a journalist, the line between journalism and fiction is blurring. "In a strange kind of way, that is happening across Pakistan. You find all kinds of stuff made up in newspapers and you'll find books which are supposedly novels are probably truer than other stuff." The view was very much that the presence of journalists and activists was important at events such as this because literature can write about and deal with the state of the country in a way that newspapers and media sometimes cannot. 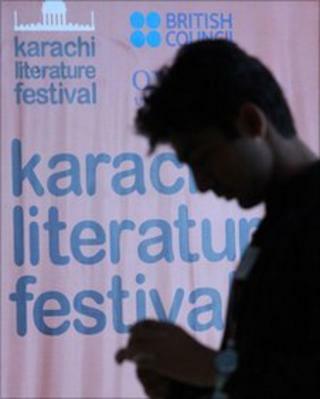 For the writers and journalists, the festival was also a chance to show that Pakistan is not all about militancy and that the country has people who are forward-looking and, in the words of political analyst Zahid Hussain, capable of providing a "strong narrative countering extremism". Many hope their voices will be heard beyond the corridors and rooms of a Karachi hotel on one sultry weekend. Nosheen Abbas is a journalist based in Pakistan.